Charles Patrick is a distinguished litigator who has played integral roles in some of the most significant public health litigation in American history, including state tobacco cases that led to the historic national master settlement. 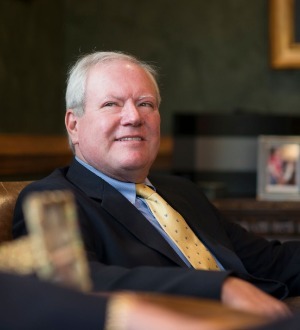 He is a founding member of RPWB and serves on the firm’s three-person executive committee. Born in North Carolina, Patrick’s father was in the mining business and brought the family to Jonesville, South Carolina. Charles met his wife, Celeste, at Furman University, where he was a history major. The pair married after graduation and both headed to Columbia, where Charles studied law at the University of South Carolina School of Law and Celeste began her study of medicine. While in law school, Patrick was executive editor of the law review. He soon joined Terry Richardson and Ron Motley, who were heavily involved in the early stages of asbestos litigation, and became the first attorney with Blatt & Fales to work out of an office in Charleston in 1980. Patrick and the rest of the small firm focused a great deal of time and energy on asbestos litigation, which was a cutting-edge area of law at the time. Their efforts to bring justice to hard-working men and women were soon bolstered by the discovery of internal documents proving manufacturers knew of the health consequences of asbestos. In all, Patrick tried more than 50 individual asbestos cases and four mass asbestos consolidations. Many thousands of workers who suffered the crippling health effects of asbestos exposure continue to benefit from the firm’s work. In 1988, the firm changed names to Ness, Motley, Loadholt, Richardson & Poole and soon thereafter began to set its sights on holding big tobacco accountable for causing the largest public health crisis in the world.Patrick was an initial member of the Mississippi tobacco trial team that pioneered the concept that a state entity is entitled to recover healthcare costs from tobacco companies for the damages caused by the use of their products. He played a pivotal role in crafting the legal theories and building the evidence required to bring such cases. Litigation on behalf of attorneys general in Mississippi, Florida and Texas settled for a combined $40 billion and tobacco companies soon entered into a $200 billion master settlement with the remaining states. This money has been used to compensate states for their healthcare spending and to educate the public and, in particular, children about the very serious risks of using tobacco products. In 2002, Patrick joined three other partners to form RPWB. The following year, he helped prepare a class action brought by smokers of “light” cigarettes against Phillip Morris in Illinois. The case, tried by other RPWB lawyers, resulted in an $11.5 billion verdict. Although the judgement was reversed by a narrow majority of the Illinois Supreme Court, the theory advanced by the class has been approved as valid in other state courts and the matter is still under appeal. Patrick remains heavily involved in tobacco litigation and other public health matters on behalf of governments. He is a foreign legal consultant for six Canadian provinces seeking to recoup public health spending. Outside of his law practice, Patrick and his wife own Patrick Properties, a hospitality company that owns and operates several Charleston-area special events venues and restaurants, including Parcel 32, the American Theatre, the William Aiken House and Lowndes Grove Plantation. The company has been credited with jumpstarting redevelopment along Upper King Street in downtown Charleston, and received the National Historic Preservation Award from the National Trust for Historic Places. Charles and Celeste Patrick have served on a number of civic boards and charitable organizations, including the Trident United Way, Charleston Promise Neighborhood, Conservation Voters of South Carolina, Southern Environmental Law Center, Lowcountry Chapter of the American Lung Association, Furman University Board of Trustees, MUSC Foundation Board, Charleston Stage, Charleston Symphony Orchestra and the Gaillard Performance Hall Foundation and Management Corporation. The couple has two children, both of whom have followed in the family businesses. Their son, Charlie, is a prosecutor with the Ninth Circuit Solicitor’s Office and their daughter, Laura, owns the Bay Street Biergarten. In his spare time, Charles enjoys playing tennis, hiking, reading and spending time in the mountains.